I had the opportunity to attend the International Coach Federation (ICF) 2018 “Global Leaders Forum” – a gathering of ICF chapter leaders from all over the world. It was an amazing opportunity to learn from other professional coaches and to plug-in to what’s happening in the coaching industry at the global level. 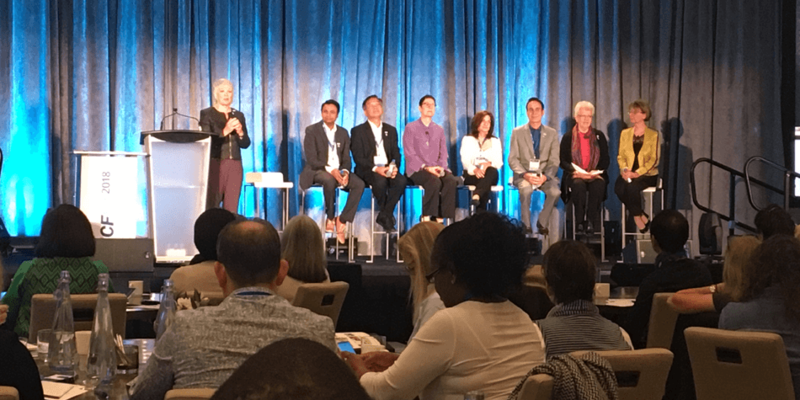 At one point, attendees had the chance to hear from a panel of ICF global board members featuring an illustrious group of top global coaches including Tracy Sinclair, PCC (UK), Sara Smith, MCC (USA), Jean-Francois Cousin, MCC (Thailand), Rajat Garg, MCC (India), Wai Leong, MCC (Malaysia), Hilary Oliver, PCC (UK), Marcia Reynolds, MCC (USA) and ICF CEO/Executive Director Magdalena Mook. Bring Energy: True leaders don’t have to force or fabricate enthusiasm. They emanate energy authentically due to their love and care for the work they’re doing. Stay Connected to Your Why: Leaders need to stay connected with the underlying purpose of their work. What’s the greater impact of the work and why is it important? Think “Power For” vs “Power Over”: When leaders are acting from a “power for” perspective, they’re taking a stance of service, generosity and collaboration, which is more effective than the sometimes-tempting inclination to command and control. Lead as a Demonstration of Passion: If a leader isn’t truly passionate about the industry, organization or team in which he or she is working, it’ll be a challenge to lead. But once leadership and passion are in sync, the related tasks and challenges feel a little easier. Make the Task the Master, Not Your Ego: If the task is the master, then no one on the team is more important than the other. Even if you’re the titled “leader,” acting from a humble and collaborative place can bring about the most engagement and best ideas from the team. Manage Yourself: We all have things to tamp down or keep in check, whether that involves talking less, listening more, being present, speaking up when it counts, exercising empathy or being open to another perspective. Ask for Help: Leaders often think they have to do it all or know it all. But, a savvy leader asks for help when needed in order to harness the strengths, talents and support of others around them. Trust Both Your and Their Intention: Leading from a place of trust and belief opens up the space for you and others to leverage more creativity, resourcefulness and potential. If, instead, leaders distrust themselves or others, a lot less is possible. Balance Being the “Troublemaker” and the “Peacemaker”: At times, leaders might need to challenge the status quo, play devil’s advocate, or push boundaries. At other times, they need to drive consensus, find common ground, and foster cohesion. Effective leaders know how and when to utilize each approach. Believe in Possibility: A leader must be able to envision and champion an aspirational future, even when no one else can see it. This belief in what’s possible can spark increased motivation and bolder action in others.